A picture of wee Waits the last time we went to the dentist, age 6. I recently read an article about a healthy lifestyle blogger who was raising her son vegan until he suffered from terrible tooth decay. She blamed the veganism. 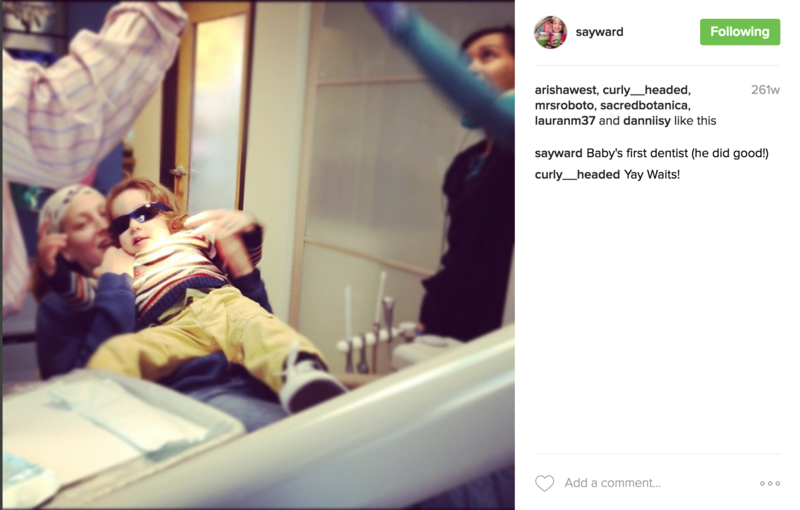 It’s an argument I’ve heard over and over: vegan/vegetarian children have teeth issues. I cannot say for sure whether there’s any truth to that, since all the “data” is anecdotal (not experimental), but I can say this . . . I know that it is 100% *possible* to raise vegan kids with perfectly healthy, perfectly perfect teeth. I know this because I’m raising one! And I’ve written before about the food and supplements we take for optimal health, but I’m wondering if there’s interest in a post specifically addressing this? 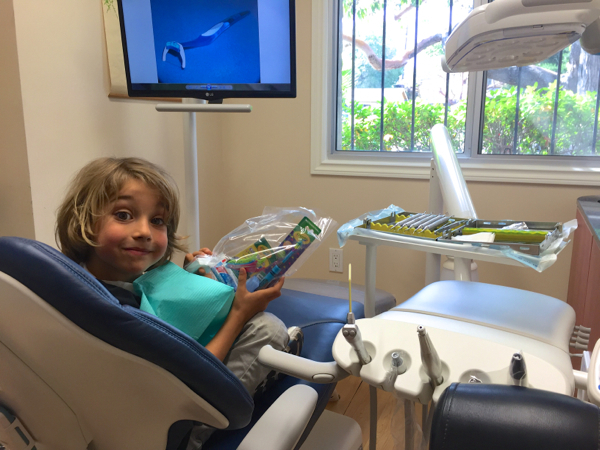 On optimizing teeth (and bone) health when raising vegan kids. Yay? Nay? Lemme know! So okay, let’s talk about that. The first thing I want to say, though, is that so much of dental health, and whether or not a kid will develop cavities, is determined by factors that are out of our control. I do believe that dental health can be mitigated, augmented, and even at times corrected, by changes in diet, lifestyle/hygiene, and supplementation. But ultimately, there are forces at work that are totally out of a parent’s control. Genetics, environment and exposure, maternal physical and mental health during fetal development, etc, all play a role in the dental outcomes of children. And although I do strongly believe that my commitment to Waits’s dental regimen has aided in his excellent oral health, I will not claim complete credit for his success, because I don’t know what DNA he was dealt, and what environmental influences he did (or more importantly, did not) encounter, and so on. As well, I would never want to implicate the parents of children who have had dental issues. I have known so many mamas (both vegan and omni) who did all the right things, and still their kids ended up with dental carries. It happens, and sometimes it’s completely out of our control. So I’m not taking credit, and more importantly, I’m certainly not casting blame. With all that said, word on the street is that vegan and vegetarian children have crappy teeth. The root of these rumors can be traced back to the good folks at the Weston A Price Foundation (WAPF). 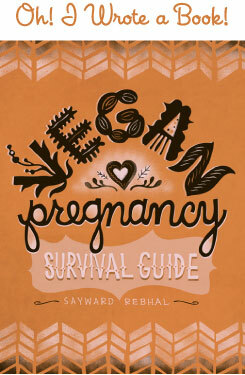 They really do have it out for vegans and vegetarians, and they’ve had a lot of influence in the natural living/healthy eating community over the past decade or so. But the interesting thing to me, is that Dr. Price really was an awesome dude, who made some incredible discoveries and was able to connect nutritional threads that no one else was aware of back when he was alive (he did his work in the 1930s). So I actually have mad respect for Weston Price, which is why I’ve invested a whole lot of time into investigating his ideas. I’ve spent a lot of hours hanging out in online WAPF forums, and reading WAPF literature. And dang those people hate vegans! Weston Price was a dentist, so it makes sense that his followers are really focused on dentition as a marker of overall health. And although I disagree with many of the conclusions that his namesake foundation has drawn, and now promotes, I do think he was onto something. I do think there’s a lot that can be learned about optimal health – especially in the dental realm – from that old dude, and his 80 year old work. So this is the plan that I’ve pieced together, after years of extensive research. It’s a combination of knowing what is optimal, and accepting what is practical (pretty much the same as my overall approach towards nutrition and wellness). It’s a three-pronged approach combining diet, hygiene habits, and supplements. 1) Diet: We all know that a diet low in sugar is a diet that makes for happy teeth. Sugar, especially processed and refined sugars, but also including natural sugars from fresh fruits and dried fruits, creates a perfect habitat for growth of the bad bacteria that causes cavities. So firstly and foremostly, we eat a diet that’s low in sugar. We do eat fruit, dried fruit, and fresh green (fruit juice sweetened) juices, but not all day every day. And we keep the refined sugar intake to a great minimum — maybe once a week at most. Less obvious than sugar though, are a few other macronutrient groups that play an important role in dental health success. Primarily: protein and fat. I make a concerted effort to guarantee that Waits eats a significant amount of protein. And I know, I know, it’s a touchy subject with vegans. But hear me out. Sufficient dietary protein is essential for the normal development of bones and teeth. Protein is high in phosphorous, which is an integral component in the protective outer enamel of our teeth. But more importantly, protein is intimately linked to proper calcium absorption. Your body needs protein to be able to use the calcium necessary for building strong bones and teeth. You can read a more thorough analysis of the science surrounding calcium, protein, and bone health, from The Vegan RD. But suffice it to say, make sure your kiddos are getting enough concentrated sources of plant-based protein (these include buckwheat, chia, flax, hemp, oats, quinoa, amaranth, peanuts/peanut butter, pistachios, soy/tofu/tempeh, seitan and other wheat meats, and nutritional yeast). Okay, moving on from protein . . . parents, please do not fear fat! In fact, embrace it. FAT IS YOUR VEGAN KIDS BEST FRIEND. Fat is essential. A growing body needs it. I know in this wacky vegan community where fat-phobia runs rampant, this might actually be the most controversial thing I’ve ever said (and that’s really saying something!). But seriously, aside from the fact that vegan diets are naturally calorie-light, and wee growing bodies burn through calories in a flash, making concentrated calorie-boosters like fat an excellent energy source for vegan kiddos . . . aside from that . . . fats are literally a requirement in order to properly absorb a number of essential vitamins. There are two kinds of vitamins: water soluble, and fat soluble. Water soluble vitamins are the ones you can’t OD on. B12 for example — have you ever noticed that the dosage of B12 tablets is like, thousands of times higher than the “recommended daily intake”? That’s because B12 is water soluble, so you can’t get “too much”. If your body gets more than it needs, it simply passes the excess in your urine. Easy peasy. Other vitamins are fat soluble. This means that in order for your body to absorb them, they requires fat as a binder. The fat soluble vitamins are A, D, E, and K. Coincidentally, three of these are key players in building healthy teeth! Vitamin A (vegans eat carotene and our bodies are good at converting it into retinol, the usable form of vitamin A), Vitamin D (the only vegan sources are certain mushrooms and fortified plant milks and faux meats), and Vitamin K (K1 is abundant in plant foods, K2 is not. Our body converts K1 (which helps blood to clot) into K2 (the one used for building bones and teeth), but conversion from K1 to K2 can be very very low — more on this later!) are the three key fat soluble vitamins that work in congruence with calcium and phosphorous (among others) to build strong bones and healthy teeth. Vegan children who are raised on low-fat diets are at risk of malabsorption of these critical vitamins. This is one of the primary reasons I do not advocate a low-fat diet for vegan kids. So, I make sure that Waits eats plenty of fat. In whole food forms, like coconut and nuts and seeds and avocados, but also in concentrated forms like olive, coconut, and hemp oil. We love Magic Beans! And the last component of diet, in addition to those important macronutrients, is the dietary micronutrient calcium, which should always be at the fore of your thinking when feeding your kiddos with optimal dental health in mind. Calcium is abundant in vegan diets as long as the diet includes lots of leafy greens . . . which of course, can be tough for picky kids! So if your kids won’t eat their greens, make sure they’re drinking them! Get on those green smoothies and green juices. Other than greens, some awesome dietary sources of calcium include: almonds and almond butter, beans, blackstrap molasses, calcium-set tofu (the package will say, or look at the calcium content on the nutrition label), fresh or dried figs, sesame seeds and tahini, and seaweed. Aside from careful and consistent brushing, we try to floss as often as possible. Ideally we would floss every day, but yeah right. We do our best. And we also make sure to go to bed with clean teeth. Only water after brushing, no bedtime snacks or milks, or else we brush again before sleep. At this age, those are the main health hygiene habits that we make sure to do. When Waits is older I’ll introduce him to tongue scraping and oil pulling, but for now, this is working just fine. *** A Note On Fluoride: Don’t ask me about fluoride! I don’t have the answers. I wholeheartedly believe it shouldn’t be added to our water, but beyond that, I just don’t know. I haven’t spent enough time with the research, really digging in the way I like to do before I share my thoughts with all of you. So, I can’t give a definitive opinion on fluoride. Sorry! 3) Supplements: There are two primary supplements associated with building and maintaining healthy teeth in growing kids — Vitamin D and Vitamin K2. Calcium, phosphorous, and the other micronutrients should be obtainable through diet alone. But D and K2 are not sufficiently present in plant foods, and therefor should be supplemented. Weston Price identified something that he called “Factor X”, an elusive dietary component that allowed traditional populations to develop healthy dentition. Traditional populations of people tend to have wide dental arches — plenty of room in the mouth for teeth to grow — and this is a marker of optimal health. As traditional populations moved away from eating their native diets, and moved towards more modern processed foods, Price observed that their jaw configuration would change, literally in just one generation. Parents eating traditional diets would have wide dental arches, while their children eating primarily processed and refined foods would have narrow arches and crowded mouths. He noticed this phenomenon in multiple populations across the world. Modern science has now identified “Factor X” . . . as Vitamin K2. Vitamin K2 works with Vitamins A and D to help bone minerals deposit themselves in the right place. If there’s not enough A, D or K2, then bone and tooth problems will occur. It doesn’t matter how much calcium and phosphorous your kid is eating. If they don’t have the fat soluble vitamins to help the minerals know where to go, they won’t be able to build teeth and bones. K2 is only present in a select few plant foods, mainly natto which is stinky fermented soy slime and a pretty hard sell for kids. And as noted earlier, our body can convert the abundant K1 that we eat in leafy greens, and make K2 inside our bodies. The problem is that conversion efficiency is very low, and it’s hard to know if you’re meeting the minimum requirements (fats can aide in conversion of K1 to K2 — another reason to not be afraid of healthy fats!). But inadequate conversion is not a risk I’m willing to take with my kiddo, so I’m happy to hedge our bets and give him a little extra help, in the form of a supplement. D is also rare in plant foods, found only in some mushrooms that are irradiated during growth. It’s often added to plant milks and faux meats, and of course our bodies synthesize it when our skin is exposed to the sun. But again, it’s hard to know how much you’re successfully making and how much of what you eat is absorbed and stored. The vast majority of people who live outside of the equatorial range are deficient in vitamin D. So for me, again, this is a no-brainer. It’s not a risk I’m willing to take, and I’m more than happy to supplement my kiddo. Now Foods Vitamin K2 (MK-7): I love these vegan capsules because I can empty the powder into the blender when I’m making our daily smoothies. This is such an easy way to get supplements into kids! You could also mix the powder into hummus, soups, or other foods, if your kid is not a smoothie kid. MK-7 is the best form of K2. MRM Vegan Vitamin D3: This is my favorite vegan D3. Again, I empty the capsules into our daily smoothies. D3 is the most bioavailable form of vitamin D, and 5,000 IU is a good dosage. Global Health Trax Vegan D3 Spray: Some parents prefer a spray for ease of administration, and this is my favorite spray that’s D3 (not D2) and vegan. If your kiddo is a picky eater who only lives off of vegan mac n cheese, then maybe you want a well-rounded bone-building multi-vitamin that includes an array of minerals along with the D and K2, such as calcium, magnesium, phosphorous, and boron. I love Ortho Bone Vegan, which I used when Waits was younger and pickier. The Jarrow Bone Up Veg Formula is also great. Screen shot of my Instagram feed from waaaay back. 261 weeks ago! First trip to the dentist, in the Portland days. ♥So in summary, I am happy to report that Waits has never has a single cavity. Can I 100% credit our vegan diet and our healthy lifestyle for this success? Nope, I can’t say that for sure. But what I can say is this — I am 100% positive that it is possible to have a vibrant, happy, healthy, cavity-free kiddo who is 100% vegan from birth. It’s possible. ~~~Hey-o! I am super duper not a doctor, or a nurse, or a health care practitioner of any kind. This post represents my personal thoughts and opinions and is in no way meant to be taken as medical advice. Woo-hoo! Hi Sayward! I love reading your blog. I don’t comment much anymore, but you always inspire me with your activism and call for positive change. In that spirit of positivity, I feel compelled to comment as a former vegan/plant-based eater who now eats in more of a Weston Price-style way. I certainly don’t speak for anyone else, but I would argue that Weston Price folks don’t hate vegans. I have a feeling you don’t really believe that. From what I’ve read, the leaders within Weston Price aren’t supportive of vegan/plant-based diets, but I cringe to think that they hate others for their personal choices. At the very list, I’m living proof of at least one person who doesn’t feel that way. But seriously, I have spent a lot of time with WAPF literature. And I have seen representatives and leaders from WAPF state definitively, on countless (truly, I couldn’t count them all if I tried) occasions, that raising children as vegans is literally child abuse. That’s basically the explicit position of WAPF. So yeah, I think “WAPF hates vegans” is a fair comment to make on a personal blog. They are hostile to my family. Period. 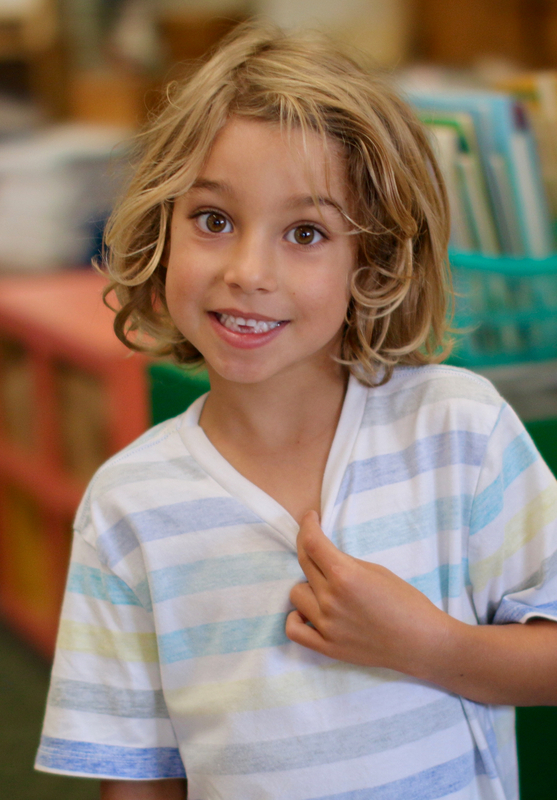 42% of children 2 to 11 have had tooth decay in their primary teeth. I swear people just want to invent excuses as to why they can’t be vegan so they feel better about not making compassionate choices. When I was a child I often had cavities. Once I became an adult and had to pay for my own dental bills I started flossing. I have never had another cavity. I thought I just had bad teeth but it was my own poor decision making. I had never heard the claim that veg*n kids have more cavities. 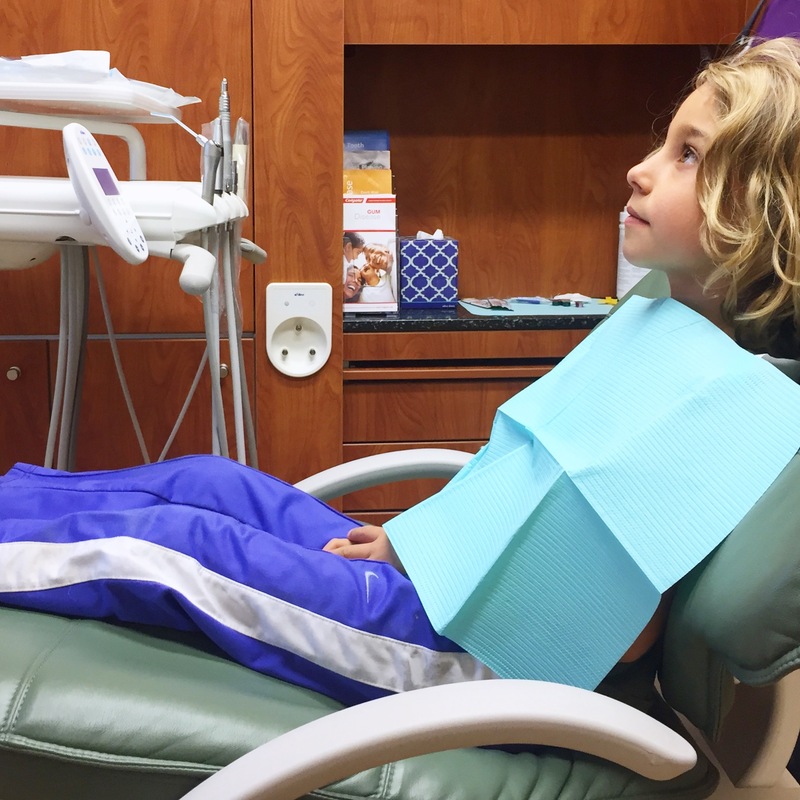 My experience seems the opposite – my girl is the only kid she knows who hasn’t had a single cavity (some of her peers have had multiple cavities in their short lives!). Still, this was great and helpful and I’d honestly never thought about supplements for bone and tooth health. So while I’m boycotting Amazon, I think I’ll check these out on iherb or vitacost. Thanks! Great info!! Thank you so much for posting this and with links to the brands of vitamins! So glad you’ve had the opposite experience! That’s why I don’t trust the rumor mill. For every bad anecdote, there’s a great testimonial. But it’s all just he said – she said without some actual controlled scientific study. Thank you for this well thought out post. Great information! Hello <3 I would love to hear more about your oil pulling routine. I know you talked about it in 2011 and included a link for more info. But do you keep up with it often? What benefits have you experienced with it? Do you really do it first thing in the morning? Our holistic dentist said she sees vegans and vegetarians have healthier teeth and gums! We just went to the dentist again and again, all clear! I asked the hygenist if she’d heard the theory that veg*n kids have more cavities and she hadn’t either. Here’s hoping that someone will start doing the science on this question! If I were vegan and raising a vegan child, I think I would feel very attacked by that as well. Thanks for sharing more about your perspective. But, just so you know, I am a member of the Weston Price Foundation and I most certainly do not hate vegans. Yes! Been meaning to do that for *years*, thanks for the push!! Awesome news, thanks for sharing Natalie! Good to hear (from quite a few folks) that the professionals seem to understand the situation more comprehensively than the internet rumors would indicate . . .
And I do appreciate so much that you are bringing that voice and that perspective into WAPF. Thank you Carrie! ill say one thing you can use, it is a critical logical thinking and common sense. if i raise my kid a vegan, and make him eat all the candies and chocolates and junk foods that are vegans, he is gonna have problem with his teeth. i can be a vegan, while eating candies all day every day… and i will develop serious health repercussions, that isnt a vegan problem, that is a “my choice of food ” problem. yes vegans can have teeth problem, but so does any other kid.